Mail-Away Vintage Rocket Firing Boba Fett Offer - Last Day! Just a quick reminder that today is the deadline for the Vintage Collection Rocket Firing Boba Fett mail-away figure. Requests must be postmarked by TODAY to qualify. Click here to download a Redemption Certificate if you still need to get your rocket-firing Fett! The Official Star Wars Website has posted the initial Celebrity Guest List for Disney Star Wars Weekends 2011. Click on over to check out which celebrity guests from the Star Wars Universe (including the movies and animation) will be attending each weekend. 12" Figrin D'an Coming Soon from Sideshow Collectibles? Sideshow Collectibles has updated their facebook page with a tease - "The Bith leader of the Modal Nodes will be playing his way into your collections". Keep an eye on future newsletters for more details on how and when Figrin D'an will be released! Entertainment Earth is now taking pre-orders for an exclusive Revenge of the Sith Obi-Wan Kenobi Mini-Bust from Gentle Giant. The bust is limited to only 1,100 pieces worldwide and should ship in July. It looks like LEGO will be running a Star Wars Promotion next week. The details haven't been posted on-line, but it sounds like you can get a free Black ARF Trooper mini-figure with a $75 purchase on May 3rd and 4th. The gang at Sandtroopers.com have managed to dig up a sneak preview of the yet-to-be-announced Savage Opress figure from Hasbro! 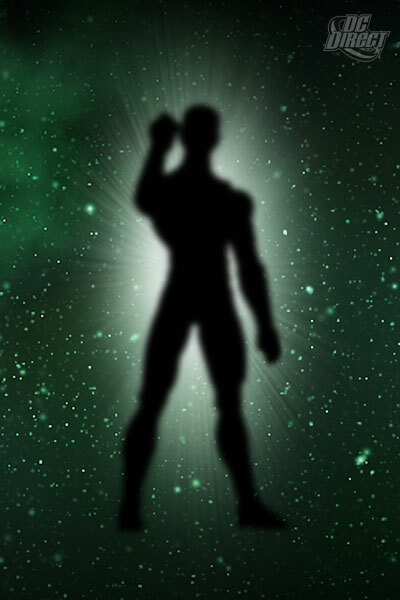 Is he a pack-in or a basic figure? No one knows yet! Click on over to check out the pics and stay tuned for release info. StarWars.com has posted a look a some new Her Universe Fashions that will be available at the 2011 Star Wars Weekends at Disney's Hollywood Studios. Follow the link to check out the new t-shirts and more. A MOTC Vintage Kenner Collection? My pal Jayson over at YakFace.com has put up a post to kick off his quest for a complete Vintage Kenner MOTC collection (that's 'Mint on Terrible Card'). Have a minty figure that's stuck on a terrible, creased card? Well, he may be interested! Here's a post for all the army builders out there. Already planning your impressive Vintage Collection Rebel Fleet Trooper armies and thinking about how you'll add some variety to the ranks? Then check out JediDefender, where Jesse has posted a nice run-down of some of the heads that will fit the RFT's neck post! First, the good news - the Hasbro Star Wars Q&A Sessions will return soon. Now, the bad news - Han's Hideout will no longer be participating. Unfortunately, Hasbro had to reduce the number of participants in the program and we were one of the unlucky sites they dropped. Needless to say, we're totally bummed out about being left out this year. So, if you have a question that you'd like to ask Hasbro, don't send it to us. Send it to someone else, like my pals over at Yakface.com or JediDefender.com. If you're still waiting for your Clone Wars Sergeant Bric & Galactic Battle Mat mail-away figure set, this may interest you. Hasbro is sending out postcards alerting customers to a fulfillment delay. They are waiting for a new manufacturing run of Brics before they can ship more orders. Look for Bric to begin shipping again sometime after July 17th. Gentle Giant has updated their Facebook page with a preview pic of the 2011 Premier Guild Gift #2 exclusive - the Imperial Storm Commando mini-bust. 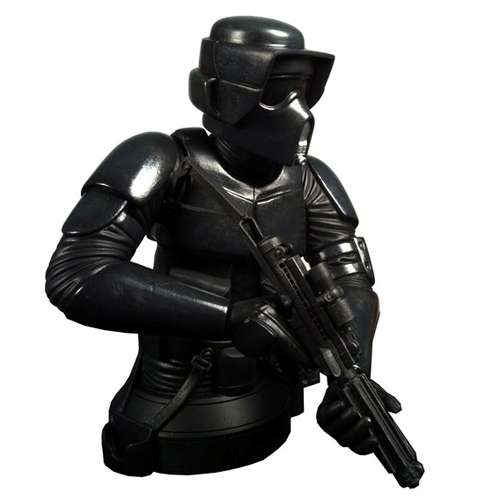 Head on over and check out the bust, which looks to be more than just a repainted Scout Trooper. Arriving at your local comic book shop this week are two new comics from Dark Horse - Star Wars Legacy: War #5 and Star Wars: Darth Vader and the Lost Command #4. Can't wait to read them? Then follow the links for previews to tide you over! Our pal Jesse over at JediDefender has posted a new action figure review and it's a big one - the Vintage Collection Rebel Fleet Trooper! Will this new version help Jesse to get over his hatred of the PotJ Fleet Trooper? Head on over and find out! Happy Easter to all our readers! We hope everyone has a great day and safe travels. Just a reminder that our pals over at JediDefender are running their annual Hasbro action figure Wishlist poll. Click on over to the JediDefender Forums and cast your Clone Wars votes today! The gang at Sandtroopers.com have posted some new packaged shots of four upcoming Clone Wars Deluxe Figure and Vehicle sets. Click on over to check out the pics of the sets, which should be here soon! The Official Star Wars Website has unvieled the title of the third Old Republic novel from Del Rey Books. Revan, which reveals what happened to Darth Revan after Knights of the Old Republic, is being written by Drew Karpyshyn, Principal Writer at BioWare and author of the Darth Bane series of Star Wars novels. Disney has updated their Parks Blog with more Star Tours goodie news. Follow the link for a look at more of the Star Tours inspired loot that you'll find when the ride re-opens later this year! UPDATE: The comments at the bottom of the page now offer up some hints at the future of the "big" Star Speeder vehicle Disney is planning! Yet another two-day sale at Toys R Us is taking place today and Saturday. Once again, you'll find a "2-for-$11.99" sale on the Clone Wars figures and Saga Legends basic figure lines. UPDATE: Quite a few folks have e-mailed to let us know the price is even better - "2-for-$10.99" at many stores and on-line! StarWars.com has added thirty new Anakin Skywalker clips from the Star Wars movies to the Star Wars Soundboards. Follow the link and have some fun mixing and mashing the sounds of the Chosen One. The summer issue of Disney twenty-three magazine, which hits stores on May 3rd, is filled with Star Wars related articles. There's an interview with George Lucas and a behind the scenes look at the new Star Tours ride upgrade. Check out StarWars.com for a preview of the issue! Just a reminder that there are only ten days left until the deadline for the Vintage Collection Rocket Firing Boba Fett mail-away figure. Requests must be postmarked by April 30th, 2011 to qualify. Click here to download a Redemption Certificate if you still need to get your rocket-firing Fett! Season Three of The Clone Wars may be over, but the online comic continues! Click on over to check out Part 14 of The Clone Wars: The Valsedian Operation to see what Anakin and R2-D2 are doing. The guys over at JediDefender have posted an interview with Sam Witwer of The Force Unleashed and the Mortis Trilogy of The Clone Wars series. Click on over to check out the interview! 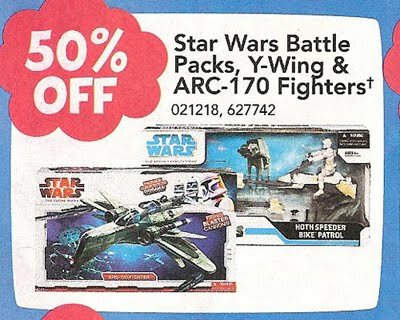 This Week at Toys R Us, you'll find another 50% off regular price sale on select Star Wars items. The sale includes the Clone Wars Deluxe Starfighter assortment (ARC-170 and Y-Wing) and the Legacy Collection Battle Packs. As always, selection varies by store... and most stores are pretty picked over at this point. Can't hurt to look though! Meanwhile, this week at Target you'll find the Saga Legends and Clone Wars basic figure lines on sale for just $6.99 each. 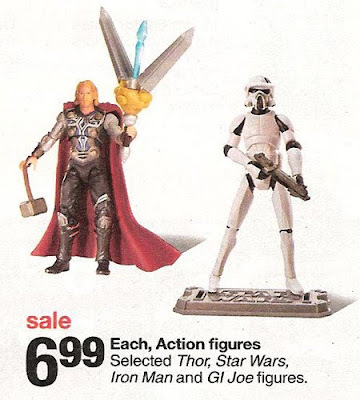 The $6.99 price is also good on GI Joe, Iron Man, and Thor, so head on out to Target and stock up! And, just like Target, K-Mart is also running a sale on the Saga Legends and Clone Wars basic figure lines. They are also offering the $6.99 price, and they have the basic role-play sabers at that price as well. And finally, this week at Walmart you'll find the Saga Legends and Clone Wars basic figure lines rolled back to just $6.50 each. Many stores have had this price for a while now, but the ad is handy to force the issue or get price matching at Target (thus negating the sale mentioned above). They also have the LEGO V-Wing set on sale for $16.88 each. LucasArts has updated the Star Wars: The Old Republic website with a new Studio Insider post. In this entry, Senior Environment Artist Robby Lamb explains how game environments evolve and transform into final fixtures, while Senior Game Designer William Wallace answers some questions from the SWTOR Community Q&A section. Clone Cards, the digital trading cards introduced at the beginning of Season 3, has just completed its first full set. Click on over to StarWars.com to check out the complete set, including faux stickers, a title card, checklist cards, and more! Tomorrow and Saturday, you'll find another two-day sale at Toys R Us. 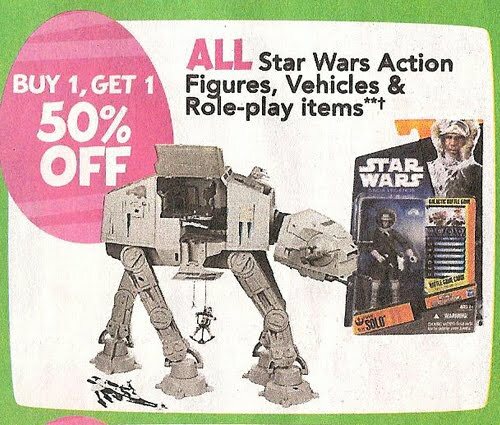 Select Star Wars toys are "Buy One, Get One 50% Off" regular price. It looks like this sale actually includes the Vintage Collection figures. Hopefully you can find more than just Wave 2 at your local TRU! K-Mart Seasonal Clearance Deal - Take an Extra 50% Off! Our pals at JediDefender are reporting a nice deal on K-Mart clearance items. You can get an extra 50% off Clearance Prices, which means some folks are finding Vintage Collection AT-ATs for as low as $37.50 each! Might be worth your while to check the Big K this week. Looks like the speculation was correct! Sideshow Collectibles has formally announced the 12" Clone Trooper Commander figure as one of their 2011 San Diego Comic-Con exclusives. Priority Pre-Ordering will begin at 10AM Pacific on June 2nd for SDCC attendees and 10AM Pacific on June 3rd for non-attendees. Uncle Milton has passed along a few details on one of the items that we saw at Toy Fair. The Star Wars Science Mini Lightsaber Dark Side Detector lets you find out which side of the Force YOU belong on. If you belong to the LIGHT SIDE, the blade will turn BLUE. If you belong to the DARK SIDE, the blade will turn RED. Look for it at a store near you now! LEGO Super Star Destroyer Coming Soon? The gang at From Bricks to Bothans has uncovered news of a LEGO Super Star Destroyer set that seems to be coming soon. Follow the link for all the details on this new mega-set! 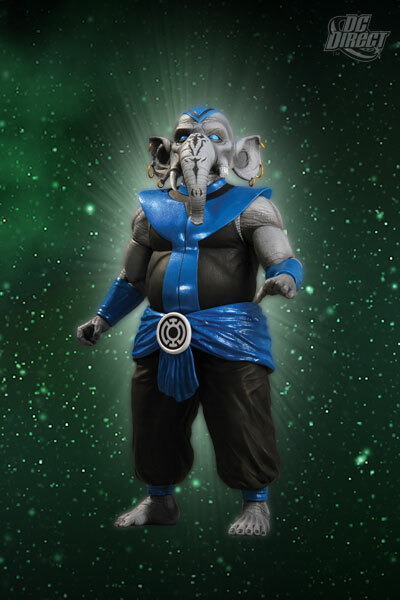 Entertainment Earth has updated their website with pre-orders for three more Star Wars items from Gentle Giant, including a new Jumbo Kenner figure! 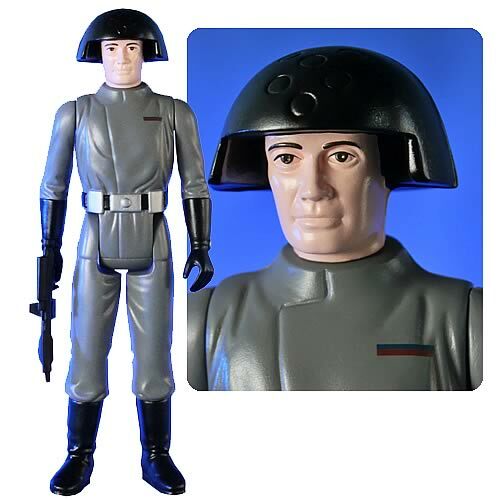 The Death Squad Commander Jumbo Vintage Kenner figure retails for $74.99 and is expected to ship in November 2011. 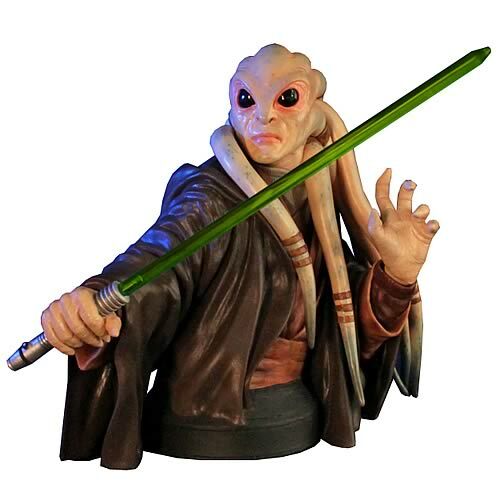 The Kit Fisto Mini Bust retails for $59.99 and is expected to ship in November 2011. 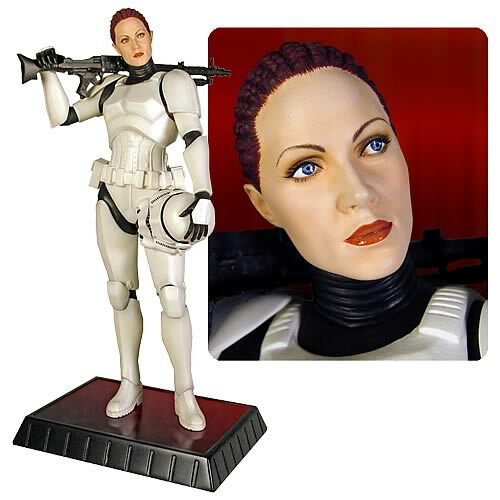 The female stromtrooper Jes Gistang Statue retails for $204.99 and is expected to ship in November 2011. The Official Star Wars Website has posted a first look at Star Wars Art: Comics from Abrams Books. The book gathers together tons of art celebrating the comics medium, as curated by George Lucas. Look for it at bookstores later this year. Our pals at Yakface.com are reporting that Hunter PR has confirmed for them that the Hasbro Star Wars Q&A Sessions will return soon. Good news for those that have been wondering what happened to the Q&A. Sideshow Collectibles has posted a few new Star Wars related questions in their latest Ask Sideshow session. Follow the link for hints at potential 1:6 scale figures for Separatist Droids, female Jedi, and more! Disney has updated their Parks Blog with Star Trader news. Follow the link for a look at the new Star Tours and Star Wars inspired-apparel, toys and more that will be available when the shop re-opens on May 4th! 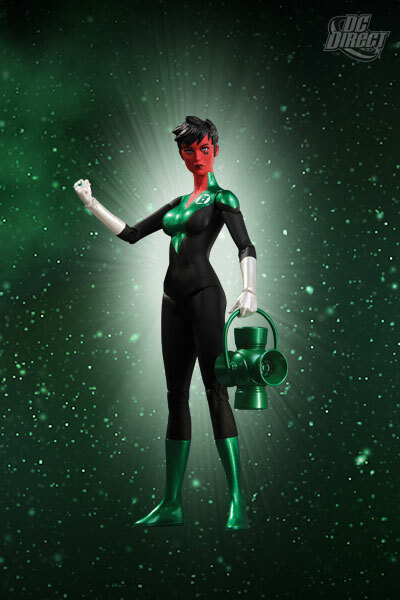 DC Direct has officially announced the release date for the Green Lantern Series 5 figures that were previewed at Toy Fair in February - Green Lantern Guy Gardner, Green Lantern Soranik Natu, Brother Warth, and a yet-to-be-revealed Sinestro! 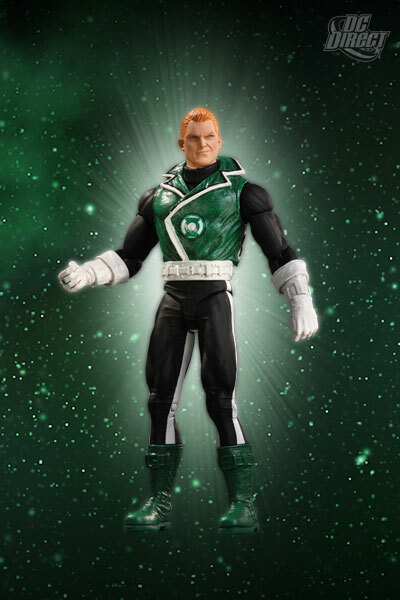 Click on the thumbnails above to check out the figures and look for them at your local comic shop on December 14, 2011! Love saving money on the toys you buy? Then click on over to Hasbro's PlaySaver.com website! There you'll find a link to plenty of coupons for various Hasbro toys, including a "$2 off a $10 purchase" offer for Hasbro's Star Wars toys. Coupon expires May 1st, so get printing! This week at Target, you'll find a number of Star Wars LEGO sets on sale. The Mandalorian Troop Builder set is shown for $8 and a number of other sets are on sale for 5-10% off as well. 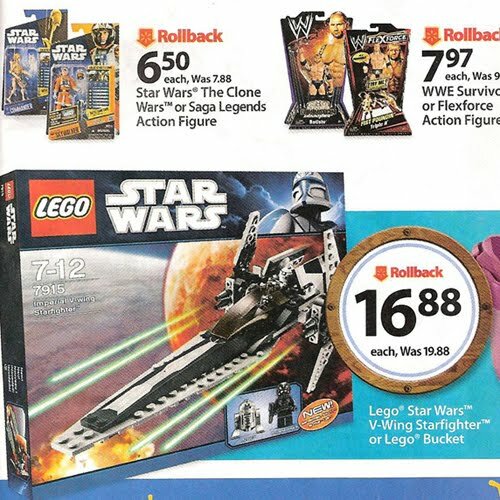 This week at Toys R Us, you'll also find Star Wars LEGO Sets on sale. 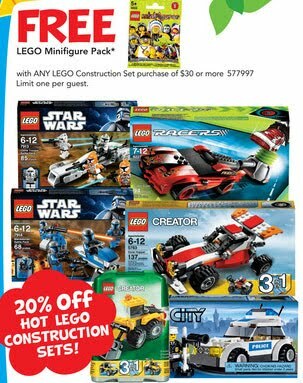 Select Star Wars LEGO Sets are 20% off and if you spend over $30, you can get a free LEGO Minifigure from LEGO's Series 3 minifigs.